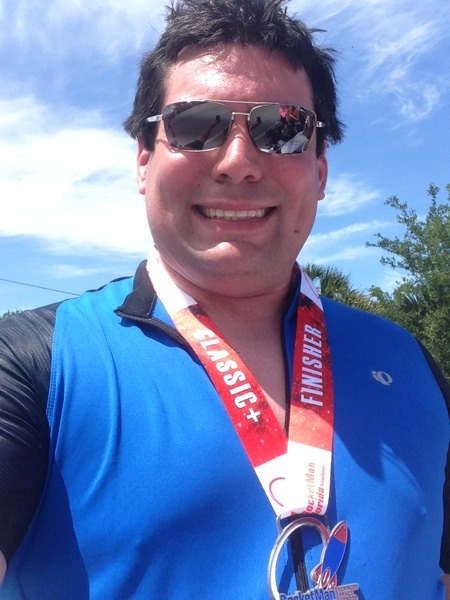 Sunday, I accomplished something: I completed a triathlon. When I signed up for this race 8 months ago, I had only been biking again for a few months, had not been in the pool in years and despised running. Now, I have re-attained my swimming capabilities close to where they were when I swam in school, I biked 33 (or maybe it was 36) miles and I still hate running. But at the end of the day, I can happily declare that I achieved my goal of completing the race. The day was amazing from the get-go. The sheer number of people that came out to put themselves through the paces of swimming, biking and running, across a beautiful landscape provided by Titusville, NASA and US Fish & Wildlife was staggering. And it all started with getting 1600 people into a corral at 5:30am to get their various supplies ready for the events of the day. The process of setting up “camp” near your bike in the transition area is one of pure art. You need to set out all the things you will need (e.g. towel, socks, water, helmet, bike shoes, running shoes, jerseys, etc.) in a way that is easy to get to and makes sure that you don’t forget anything and can shave seconds off the time in transition. My “camp” was not even close to organised compared to others. Transition closed at 6:15 and my wave did not begin until 8:00, so there was some waiting to be done. Sierra, James and I headed down to the water to watch the Half-Ironman competition begin with their 2.1 mile swim. We also ran into some of the rest of our merry band of Space Tweeps in the festive atmosphere before the racing began. At 7:45, my wave got lined up and headed into the water. Not having swum significantly in open, salty water I was reticent about this part of the event despite my swimming abilities. Not really knowing if I had made the right decision to leave the wetsuit at home despite 75F water, I was happy that the air was cool at this early hour and made the water feel all that much warmer. We had about 15 minutes to get warmed up in the water before the wave began promptly at 8. The swim course was very straight forward from a sighting perspective: from the start, head straight toward a massive red inflatable rocket buoy, go around it and head back toward a gazebo on the shore. The current was moving in the same direction as the swim, with a small exception as we turned the buoy to go slightly against the current. I swam a combination of freestyle and breaststroke to conserve energy. The swim took me 10:09 and then it was off to transition. Transition really is an interesting endeavour. You have people coming in from their swim, getting ready to get onto their bikes, shedding clothing, putting on shoes and getting out of there as fast as possible. It is one of those things you can read about until you are blue in the face, but without seeing/experiencing it, the true process can not be fully appreciated. There are some people that get through transition 1 in 2 minutes; I took 12. Since time was not my driving force in this event, I dried off my feet, put on socks, shoes, sunscreen, changed my top from my singlet to a biking jersey, filled and mixed my Camelbak and got out onto the ride. The drying of feet to a point that socks will go on is a feat (feet) in a humid environment like Florida, but it got done. I was out of transition 1 in 11:59. The bike ride was the part of the race I was most looking forward to and it did not disappoint. The looming bridge that I had posted about earlier was not as big a deal on the way out as there was a nice tailwind to help push me up the incline. On the way down the bridge, I had the benefit of Sir Isaac Newton’s magical gravity to accelerate me without much effort and help me into the nice long straight-away that led into the Merritt National Refuge. The views of trees, alligators, birds were prevalent on this stretch of the road and took me into the turn that would lead to the main area of Kennedy Space Center. The next landmarks I biked near were the Vehicle Assembly Building, Launch pad 39A, 39B and then back out again. This sounds very simple as a list, but there is vast amounts of space between each one since they won’t let anyone be nearer than 3 miles (and most at more) from a pad when a launch occurs. Needless to say that the very tall structures stood as looming targets as I biked, drawing me into them as motivation to keep on trekking forward. To be able to ride my bike this close to such monumental locations in the history of America was truly a blessing and I am so appreciative for the opportunity. Around the mid-point of the race, the winds went from tailwinds to headwinds and my very nice average speed dropped precipitously. For the remainder of the race, the wind would be blowing directly in my face or very nearly so which made it a bit more interesting to complete the distance. And one quick word on distance: the advertised race distance was 33 miles, but at mile 33 according to my watch (and that or many others’ as well), I will still far from the end of the bike portion. All told, it turned out to be a 36 mile bike ride which was unexpected but did not materially affect me. Transition 2 is far less chaotic than Transition 1 as the change is merely from bike shoes to running shoes), grab a bottle of water and get out of there. I finished Transition 2 is 4 minutes. After some water, pizza, banana and a wait in line to get my bike out of the transition area, we headed back to drop off the bike and get back to the hotel. I was not seated for more than 5 minutes before I promptly fell asleep for the next 2 hours and was dead to the world. There is a saying in the triathlon boards that I have been reading over the past few months in preparation for the race, “Do you know what they call the guy who comes in last in a triathlon? Triathlete!” Congratulations to all my friends and mental/moral support network who also achieved this goal yesterday and thank you to all those that supported me in the endeavour from the beginning, through training and cheering as the race took place; I really could not have done it without you!